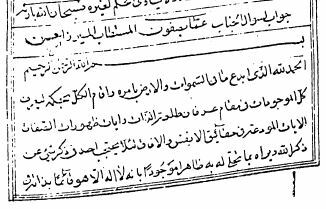 The Letter to Mīrzā Ḥasan Waqāyī` Nigār on Qur'an 50:16 and 112:4. 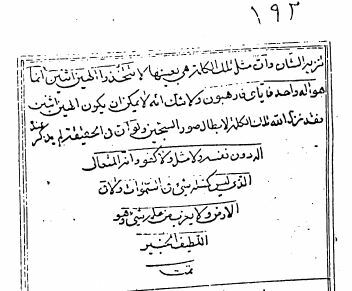 "(vii) A tafslr written in reply to Mīrzā Ḥasan Waqāyi`-nigār (the 'chronicler'). The recipient was, it may be assumed, an historian attached to the court of Manūchihr Khan. The commentary is an interpretation of two Qur'anic phrases: 'We are closer to him [man] than his jugular vein' (50:16) and 'a single rival' (112:4). A closing section deals with the subject of the movement of the heavens." (p.79). INBMC 40:180-192 (see images above). Cambridge Univ. Library. Browne Coll. Ms. F. 28, Item 7:4. At the very beginning of his comments on this phrase, its author underlines the utter singleness, isolatedness, transcendence and unknowability of the Divine Essence (al-dhāt). God has eternally "detached" the Divine "Names and Attributes" from referring to the "court" of His transcendent "Presence" (ḥadratihi) -- they apply primarily to His "Will" (al-mashiyyat). Nearness to the Divine Essence is impossible except by virtue of the theophany (tajallī) of His "Self" (nafs) the locus of His "Will" and of the Messenger or Manifestation of God. Qur'ān 50:16b alludes to the "sign of God" (āyat Allāh) which is found within the inmost human reality which is (symbolically speaking) the human "heart" (fū'ād) (see INBMC 40:181-183ff).